Jerry Maguire is one of America’s greatest romantic comedies! Only in American film could “the pursuit of” not just “happiness” but “bliss” be happening now, in this third millennium. Jerry Maguire was released in 1996 but its indomitable soul was first begun in 1776 with the Declaration of Independence. That now, for myself at any rate, sacred document has never lost its tenacity, despite the racial and emotional nightmares America has lived through. talent will always be rewarded! That talent, however, depends upon the size of your heart and soul! 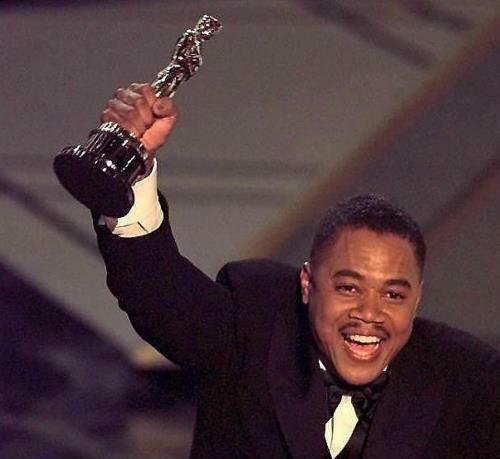 Cuba Gooding’s performance as Rod Tidwell erupts at all times with a level of Life’s Joys, yes, Joie de vivre, that would be hard to surpass by anyone. for his performance as Rod Tidwell! His bliss and gratitude for merely being alive is just the beginning to his stunning level of ecstasy over success in America! Where else on Earth is a 10 million-dollar-four-year contract even conceivable? Let alone his 11 and a half million-dollar, four-year reward for his character’s ability to almost singlehandedly win the Super Bowl. The ecstasies of Cuba Gooding Jr. are beyond heavenly. They have the size and potential power of a Solar System! Then again, why is everyone in the extraordinary cast of Jerry Maguire at the top of their game?! Cuba Gooding Jr. would not have been kept at the divinely competitive level that goes on between these two! Way beyond a buddy film, Jerry Maguire is the vision of America at its very best! At its most thrillingly competitive!!! That can’t be done without a Tom Cruise in the indisputably leadership role. Cruise and Gooding fed each other like Martin fed Lewis and Ollie fed Stan!